If you couldn’t guess it from my blog name let me tell you how much I love limes! I especially love them with tequila and triple sec in a margarita. When we have guests I fill a jug with water and fresh mint and lime ice cubes. I make the ice cubes by cutting limes into quarters and keeping them in the freezer. I squeeze fresh limes when they are in season and freeze the juice in an ice cube tray, saving them for a ‘rainy day’. I even use lime essential oil when cleaning out my fridge to get that beautiful citrus smell. A while back I thought about making lime cordial and headed over to Celia’s blog to see if she had a signature recipe. At that time there wasn’t one on Fig Jam and Lime Cordial and so I left the idea mulling around until I could make one up. This is the lime cordial recipe I discovered through a bit of fiddling. I’m going to try it with granadilla’s the next time I get given some. have you ever used essential oils? I used my lime cordial for a refreshing summer alcoholic drink of Vodka, Lime Cordial and Bitter Lemon. Tuesday’s used to be dedicated to pasta recipes, with the theme Tandy Tuesday’s using 5 ingredients. This was initiated by my friend Cindy but as Dave and I are no longer eating as much pasta as we used to, I have not been posting much on a Tuesday. For this year I have decided to dedicate Tandy Tuesday’s to my own recipes. I hope you enjoy what I have created. I love lemons and limes and this sounds like a wonderful, refreshing cordial. I can imagine it with vodka and mint! I would love your cocktail with your lime cordial. For some reason, I haven’t seen bitter lemon in years…it was one of my favorite mixers for vodka. Great idea for when it gets warm again here! Beautiful and defintiely one of your signature recipes now! Love that you used vanilla sugar, bet that really makes it amazing. MMMM! 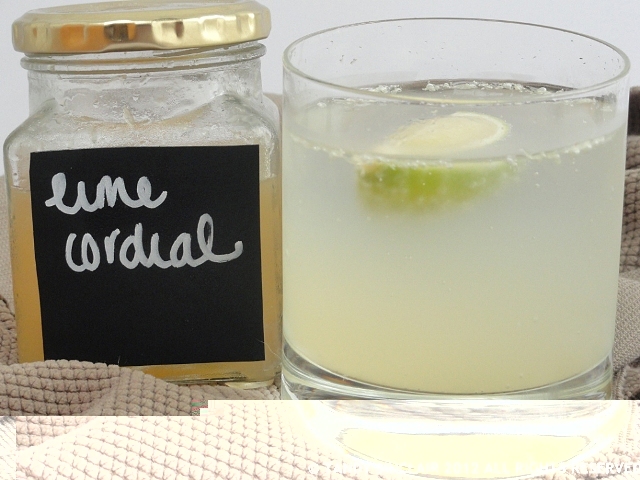 I love a good home-made lime cordial recipe any day, winter or Summer!